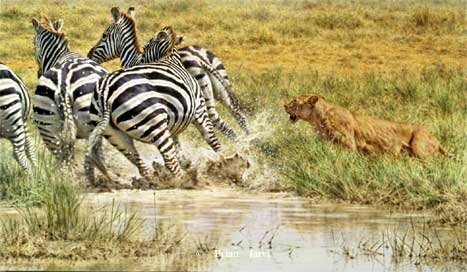 As a professional artist, BRIAN JARVI uses firsthand observation to create very popular, realistic portrayals of wildlife. By combining intricate detail, dramatic lighting, and anatomical accuracy, he has become widely known for his “up close and personal” compositions. 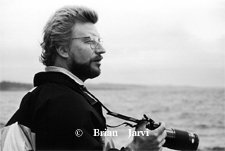 Africa and its incredible wildlife has been Jarvi’s passion for the past decade. Amidst the lush African scenery and wildlife, Brian creates new masterpieces. 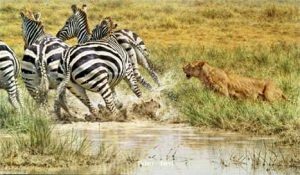 “The excitement lies in transferring situations I have witnessed on Safari onto canvas,” says Jarvi. “When choosing the themes and subjects of my paintings, I like to draw on personal experience, for example, a bull elephant making a charge or lions attacking a cape buffalo. A Minnesota resident most of his life, Jarvi is the first artist to win both the Minnesota Duck and Pheasant contests in consecutive years and only the second artist in history to win both Minnesota’s major print contests. Brian spent his youth in northern Minnesota sketching the rugged land and the animals that inhabit the area. Today, Jarvi, his wife Raelene, and their two daughters live on a lake in the north woods. Jarvi continues to go on Safari to expand his repertoire of experience and knowledge of the majestic African imagery.